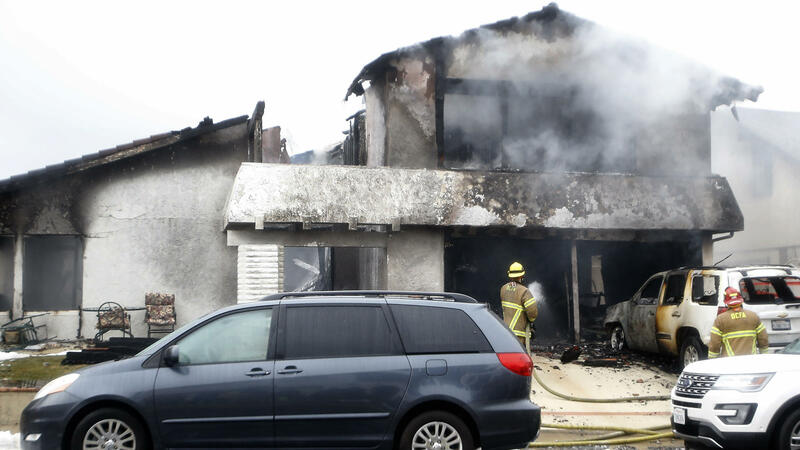 Firefighters work in the driveway of a house damaged in a deadly plane crash Sunday in Yorba Linda, Calif. Officials say at least five people died, including the pilot and four people who were in the house. At least five people were killed Sunday when a plane apparently broke apart in the air and plummeted into a neighborhood in Yorba Linda, Calif. The pilot died, along with four people in a house hit by wreckage. Officials aren't sure what caused the crash. Two of the victims owned the two-story stucco house that was hit and was engulfed in a raging fire, said Lt. Cory Martino of the Orange County Sheriff's Department. Several witnesses described a dramatic scene in which the aircraft, a 1981 twin-engine Cessna 414, burst into flames and began breaking apart even before it hit the house. Security surveillance footage seemed to confirm that version of events, showing the out-of-control plane trailing black smoke as it fell to the ground. "The plane blew up about 100 feet off of the ground. The plane blew up in the sky," neighbor Jared Bocachica told local TV station KTLA news. "I come out ... it's raining plane parts from the sky." The plane had taken off from nearby Fullerton Municipal Airport early Sunday afternoon, said aviation investigator Eliott Simpson of the National Transportation Safety Board. Citing radar data, he said the Cessna had climbed to about 7,800 feet — but after flying around 10 miles, it made a rapid descent. "The airplane appeared to break up in the latter stages of the flight," Simpson said at a news conference Sunday night. Wreckage has been found over a span of some four blocks. A wing was in part of one street; an engine fell onto another, punching a gaping hole in the asphalt. The main cabin and an engine landed in a backyard, a few feet away from a gazebo. The identities of those killed have not been released; police say the pilot, who was flying alone, was a man, and that there were two men and two women in the house. The crash prompted dozens of residents to rush out of their houses to assess damage and try to help. Some used fire extinguishers and hoses to put out smoldering flames. Around the corner from the burning house, another home had a broken window and a shattered porch pillar. Part of the plane's propeller lay in the driveway. It will take at least 24 hours to collect all the wreckage that was strewn around the neighborhood, Simpson said. The NTSB and other agencies are investigating what may have caused the deadly crash, with the help of Cessna and the company that built the plane's engines, Simpson said.